The PALETTE project aims at facilitating and augmenting individual and organisational learning in Communities of Practice (CoPs). Towards this aim, an interoperable and extensible set of innovative services as well as a set of specific scenarios of use have been designed, implemented and thoroughly validated in CoPs of diverse contexts. 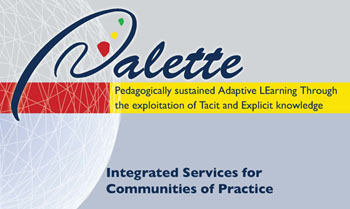 Download the 1st Year Executive Summary of PALETTE project. Download the 2nd Year Executive Summary of PALETTE project. The EACP 08 workshop, organized by the PALETTE project at the University of Tlemcen from 18 to 20 November 2008 was a real success thanks to the presence of the expertised participants recognized by the scientific community, and to the quality of the contributions dealing at the same time with technological, educational and social aspects and presented through the 5 sessions of the programme . See the workshop proceedings . Organised with the support of the Conférence des grandes écoles, the 2008 ePrep International Thematic Seminar held at Ecole Centrale de Pékin (Beijing, China) on October 28. This seminar brought together 36 participants, including an ePrep delegation composed of 19 members coming especially from Europe, to work on the theme "ePrep and International Cooperation: activities and tools". The PALETTE scientific coordinator and the Amaya developer attended the Seminar and made specific communications about the last PALETTE developments. In its action of dissemination of PALETTE achievements through demonstrations of PALETTE tools and services, the BayFac and PALETTE Web Portal service mediators and the CoPe-L moderator, have presented to the CoP - Groupe ERETES how to sustain its creation and its activity. The installation guide of BayFac has been sent to the CoP moderator. The creation of this CoP is supported by Eurostat. ePrep realised a short film on the occasion of a LimSee3 trial for its CoP taking place at Lycée Henri IV, Paris, on October 25, 2008. The film (11 min), on the theme “Annotations with LimSee3 for a real exam at Lycée Henri IV”, includes 6 sections: presentation, pedagogical aspects, technological aspects, PDM, exam, post-production. It involves two PALETTE developers, an ePrep CoP member, a student at Lycée Henri IV, and the ePrep CoP coordinator. To see the film (in French), please connect to ePrep website . European projects are always great places to get to know the most interesting people. Colleagues stemming from different countries, coming from the most varied cultures and speaking other languages bring together the best they have to offer: their competences, their enthusiasm and their positive visions of the future. It was in such a context that we got to know Rose. Amongst the seventy researchers taking part in the PALETTE project, Rose led the work on knowledge management and on ontologies. She was superior at sparking off a great deal of enthusiasm about these subjects close to her heart not only amongst her colleagues, but also amongst the professional communities with whom we worked. She knew how to work with a wide range of people from well-known scientists to the users of the web services we developed. In addition to being a brilliant, world-wide recognised and respected scientist, she had a knack of finding suitable ways to get across complex ideas to a wide variety of people. Our thoughts go out today to her family. We also think fondly of her fellow colleagues from INRIA with whom Rose worked in close collaboration. We will all miss her so much! IST programme of the European Commission (DG Information Society and Media, project no. 028038).